One of the wonderful things about the people of the country is that they do like to donate, especially around the time of year when people need help the most. Something else they like to do is get tax write offs for the money and items they donate. 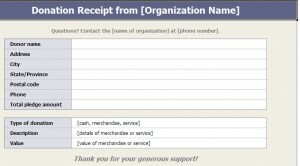 If a person wants to get a better understanding of their donations they should obtain a free donation receipt template. This template can help a person better understand where some of their donated money wound up. This template will also be a great benefit to those doing their taxes. This template is wonderful in so many ways.